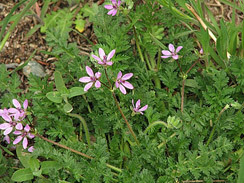 Stork’s Bill, also called filaree, grows off the freakin’ hook in chaparral surrounding Los Angeles. Here in my hood, it’s one of the most prolific leafy critters in late Spring. It’s named for the long pointed pod that actually does look quite a lot like a stork’s bill. Leaves are generally pinnate and low to the ground when young, though in older stages they can grow up to a foot high. It has small delicate light purple blooms and lacy filigree shaped leaves. 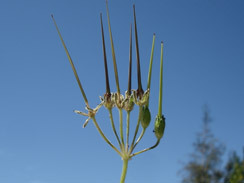 The stems and leaves are hairy. The entire plant is edible. I use the young leaves as a salad green before they grow tough and bitter. I’ve also used the tiny purple flowers in salads, and as garnish for desserts and yogurt topping for my foraged grape-leaf dolma. Spring and early summer. 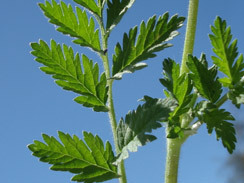 Be careful not to confuse this plant with poison hemlock which can look alike when young; look for stork’s bill’s hairy stems as opposed to hemlock’s hairless stems. Use the tender leaves from young-ish plants as a mixed salad green. Use the small beautiful flowers in salads, or as garnish.